South of Anloo in Drenthe Netherlands. 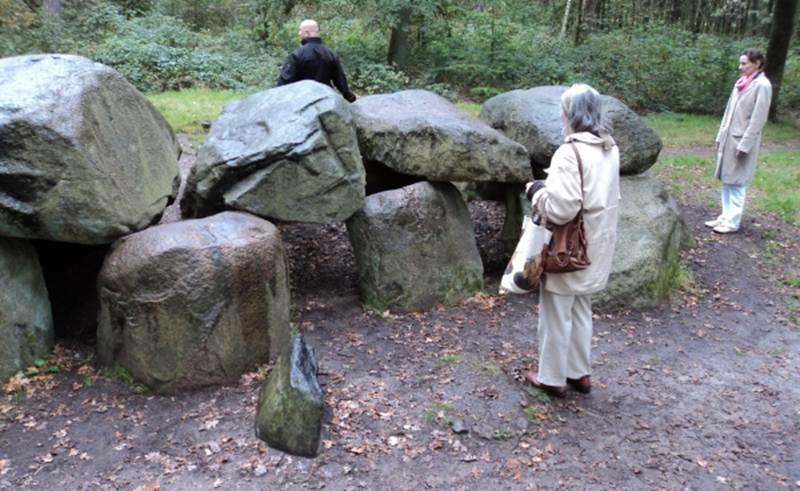 The Ley Line Group has visited three megalithic monuments near Anloo in Drenthe. which was the main reason to choose those monuments for our research. 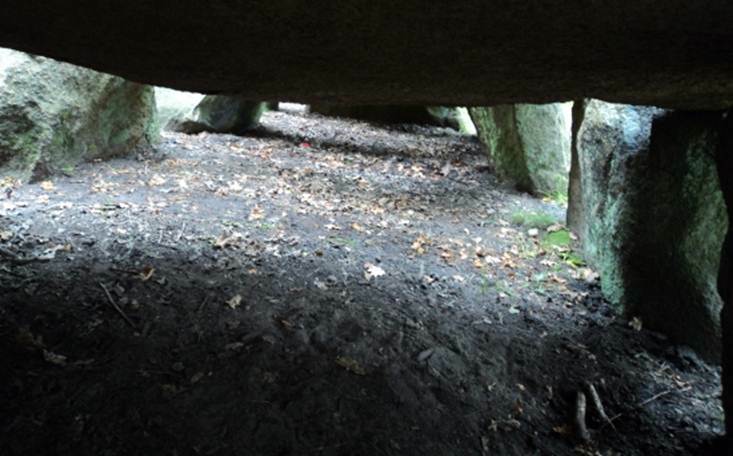 Monument D7 makes a very closed impression, when we are standing around the hunebed. It seems to everybody that this monument is somehow the input place for energies and signals. Robert is making pictures with and without the Oldfield energy filter. Suddenly the inside of the monument starts to emanate a deep blue light.
. A cold wind coming from the North West. Drizzling rain. just below the horizontal roof stones. There can't be a so-called blue shift, because only part of the picture has a blue light. This monument is almost untouched and in good shape. Here seen from the West. that this monument D7 is partly below the surface of the earth. The megalithic monument D7 seen from the East. The monument D7 is of a energetic content. We are investigating and measuring on a dark and rainy day in heavy woods. Near this monument we did not feel coldness. Agaqin this monument was untouched for a long time. 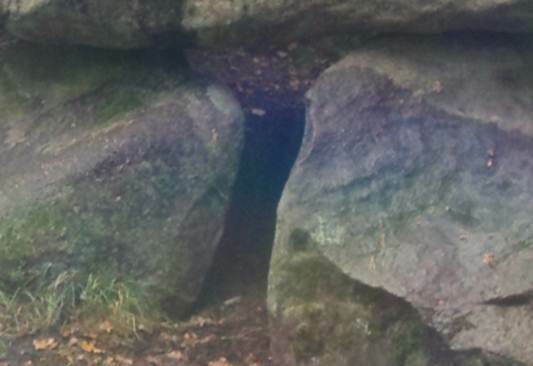 to have contact with the energies of the stones. but also of the stones itself. This is monument D7 on a dark day in the rain, in a dark forest. In the rain energies are more visible then in the sunshine. In the mean time the ladies had walked ahead and changed the energy at the D8 monument. The energy at the D7 monument is a like relay station. The energy is given through. the D8 monument is a switch relaying the energies to other places. at the holy circle stones of D7. 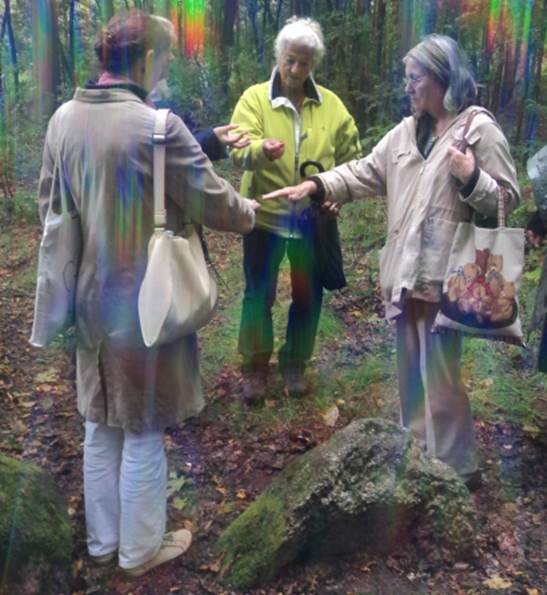 Below the hands there is clearly an energy emerging from the circle stone. The energy stays and is clearly visible. and for asking forgivenis for the disturbance of the peace of thousands of years. Prof Marijah Gimbutas dates the monuments on 3200BC. The Group walks along the straight ley line from D7 to D8. the contact with the emanations of spirits. 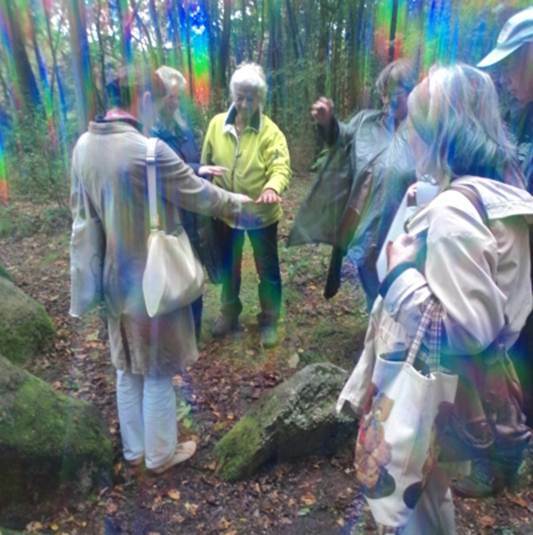 to see the earth energies. The position of the three monuments is a few kilometers South of Anloo. that is why the Ley Line Group is able to research an almost undisturbed situation. On the leyline from D7 towards D8 are gravehills grouped along this ancient line. The group arrives at D8. An open energy, very female. 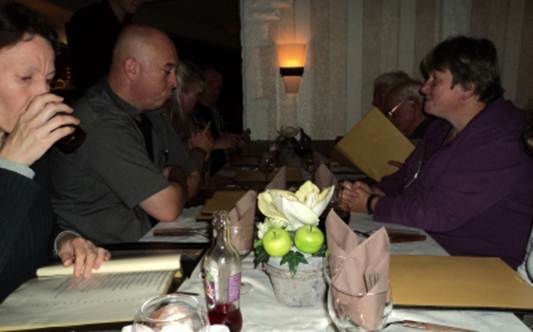 The group askes to have contact and approach. The energy of D8 is very female and refreshing. The chamber is inviting and the entrace is very visible. The chamber of D8 is very large, larger then the outside seems to be. 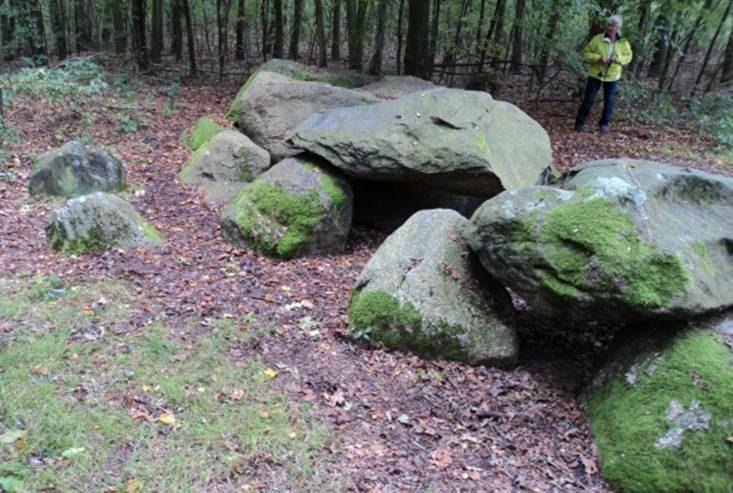 Irmala and Iris have visited a German megalithic archeological place. surrounded by several Goddess symbols, so called Queen Points or Goddess Stones. 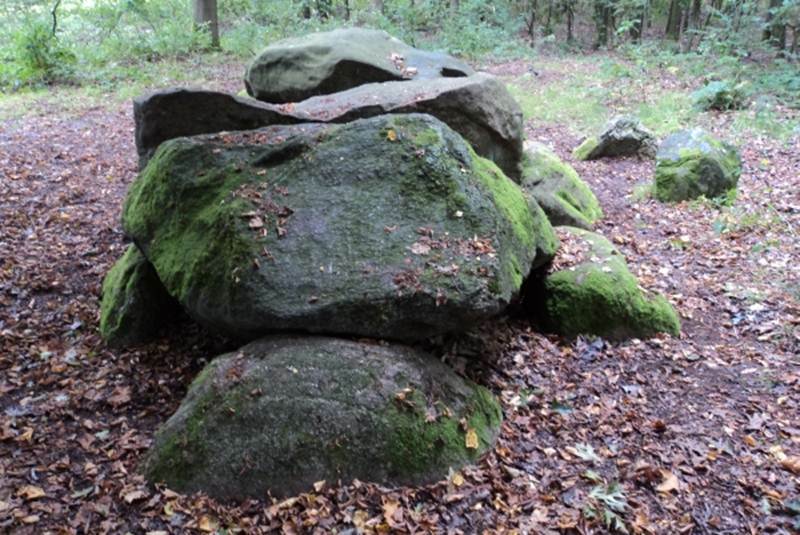 In Germany a Goddess stone has been unearthed with an image of moon and stars upon the stone. 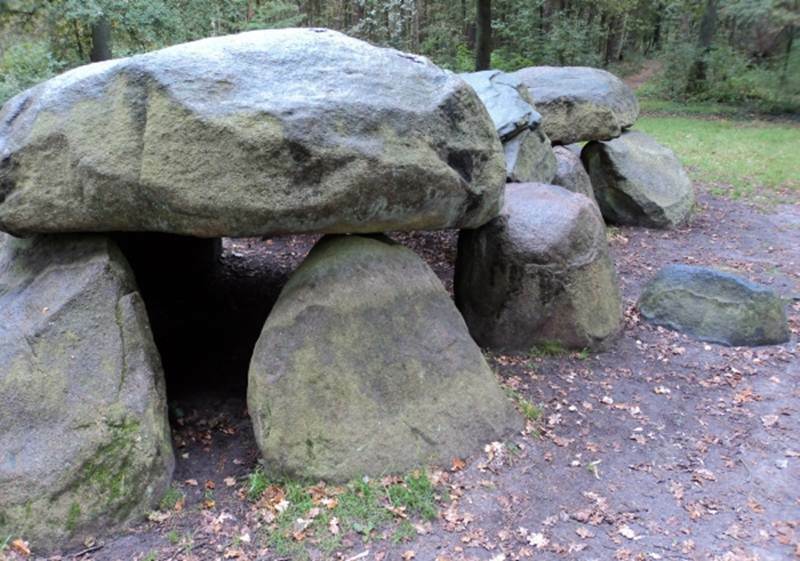 megalithic monuments in the Netherlands. This is what we will research on this excursion. Monument D8 and the switching on the energy. The chamber of D8 looks inviting and of an open enrgy. 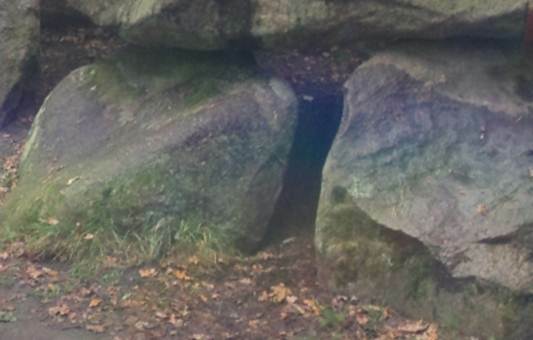 on the four Queen Points around the hunebed. First the Queen points are to be found with the aid of the pendulum, the Lecher antenna and intuition. Then the ladies were standing on the four Queen points facing the same way. standing on one of the Queen Goddess points around D8. This switched on the energy inside the megalithic monuments! This is a rainy day in the dark forests. No direct sunlight but shadow and dark clouds. Then in D8 there is a blue light, here to be seen with the Oldfield filter. Energizing the Queen points of D8. Blue light shines in the relative darkness of the dreary day. D8 is coming back to life! The chamber of D8 coloring blue. There is no discoloring on the other pictures of almost the same moment. Here is D8 not energized. The group feels very satisfied. There is also a sound inside D8. Monument D8 is vibrating with energy both of a sound and of light. The sound is a deep low bass. This sound makes the impression as if this sound has started still has to be tuned somehow. A basic tone of the instrument. The light is vibrating and blue. the day is dark, dreary, clouded without sunshine. The energies are very visible. The sound is deep and almost below conscious level. 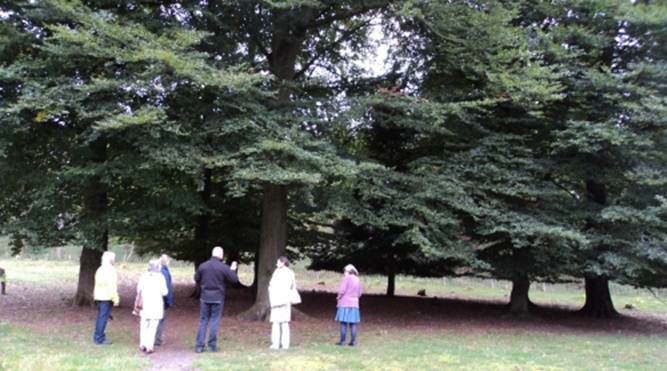 tree, like we also did in Heeze and other places. to fearies and forces of nature. Monument D9 is half destroyed. Very happy with this result the Group goes on to monument D9 in the village of Annen. is situated along a street in between some private houses. but the monument D9 is to damaged to give any measurable result. next to the remnants of monument D9. Perhaps further research will be possible. 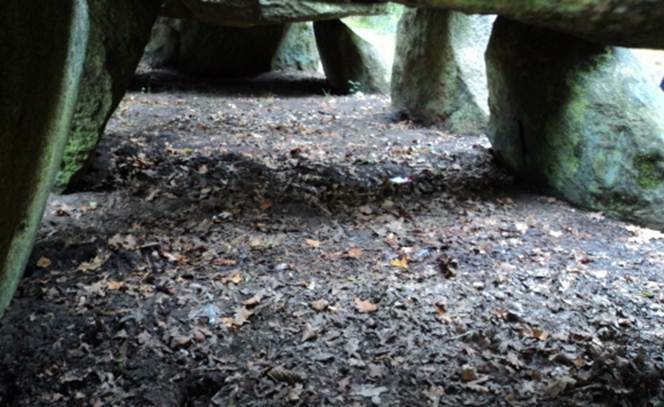 There should be a foundation be established to protect the megalithic monuments. where the stones of D9 should have been standing. Still there are energies measurable. We have to come back to this place unbiassed and open minded. after the interesting results of D7 and D9. 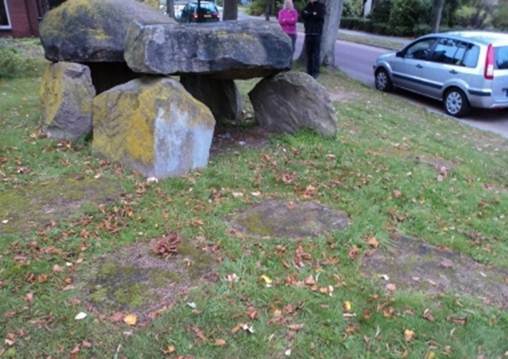 There is no respect for megalithic monuments in the Netherlands. in the Netherlands have no respect of the government and of the public. The 53 monuments still in existence are all disturbed. 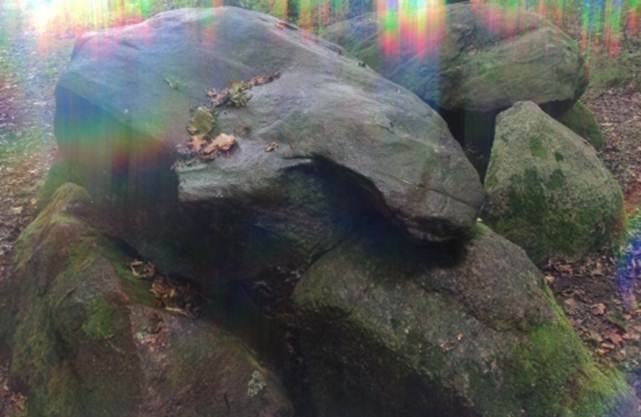 Another 25 megalithic monuments have been destroyed. 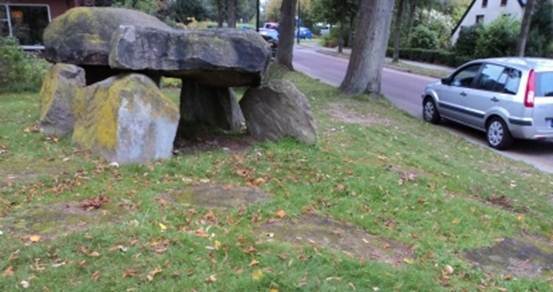 Megalithic monuments are surrounded by suburbs without any space around the monuments. Kids are climbing upon the monuments as if the monuments are part of a kindergarten. such as happened recently in Emmen. surrounding the monuments D7 and D8 have been cut away. 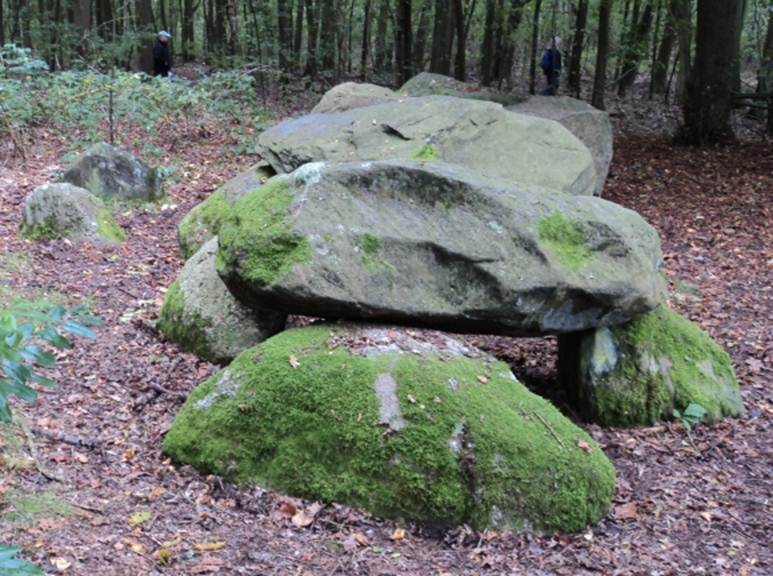 Foundation for the Protection of Megalithic Places. A nice pizza to end the day.